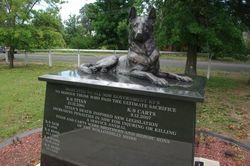 The memorial honors police dogs killed on duty. 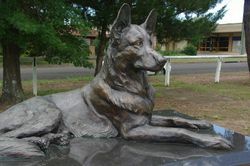 It features a bronze german shepherd dog atop a granite base - bears the names of the five police dogs killed in action since 1996, K9 Titan, K9 Carts, K9 Sam, K9 Boss & K9 Fidel. The idea for the memorial came after the deaths of Wollondilly shire-born police dog brothers K9 Titan and K9 Carts. 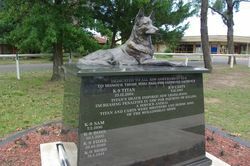 Titan was stabbed to death on December 23, 2004, during a siege at Seven Hills. Carts was stabbed on December 9, 2007, during a police operation at Corrimal. 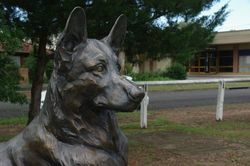 The dogs were bred and raised as pups in Tahmoor by Christine Anderson. 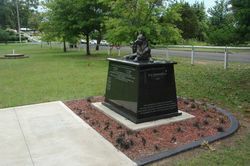 The memorial was designed by Freya Jobbins and the sculpture by Peter Lewis was modelled from Titan and Carts' living brother Rusty. Peter Raksts Memorials donated the granite and the rest was donations from the general public. 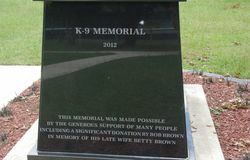 The cost of the K9 Memorial was $50,000.